Our historic theatre pipe organ, originally from Seattle's Liberty Theatre, is Wurlitzer Opus 42 from 1914, the 42nd organ made by the factory. It is currently a 3/25, although it will most likely be a 3/30 or 3/31. Originally a 3/16 Special installed in four chambers above the proscenium, on October 25, 1915 a four-rank Echo division was added in the central dome. This division was mounted on a windchest similar to that used in classical organs, very unique for a theatre pipe organ. It consisted of Trumpet, String II, Vox Humana, Octave Coupler and Tremulant. Declared by Farny Wurlitzer, president of the company, to be the instrument that put Wurlitzer on the map as a major theatre organ builder, Opus 42 became famous as a West Coast demonstration installation for prospective buyers. The theatre, a 2,100-seat modern movie palace - rather than a converted vaudeville or stage theatre - was so popular that crowds lined up for three blocks. Located at First and Pike in downtown Seattle, it enjoyed easy access to trolley lines. Famous organists at the Liberty included Henry Murtagh, the first organist, who was trained at the exclusive Hope-Jones Unit Orchestra School in New York; Oliver Wallace, who composed the scores for Dumbo, Cinderella and other Disney classics. 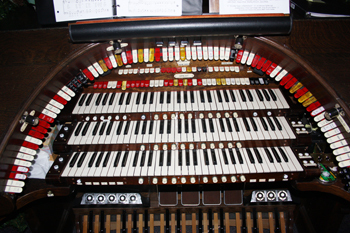 The organ was used regularly until 1929, when talkies came in. It was maintained until 1935 by Richard Simonton and Gordon Blanchard. Simonton went on to form the American Theatre Organ Enthusiasts, precursor to the American Theatre Organ Society (ATOS). Read more about the organ and the Liberty Theatre here (some information is slightly inaccurate, though. Click here for the original rank and stoplist, as compiled from a 1955 report by organ historian Eugene M. Nye. In 1955, the building was slated to be demolished, so Dr. R. Byard Fritts, professor of organ at Pacific Lutheran University (PLU), bought the organ and, with the help of several students, removed it and installed it in the PLU Gymnasium, where it was used for basketball games, religious convocations and other events. The 32' Diaphones, pipes that speak an octave lower than a piano, had to be used sparingly, as their earthshaking tones would startle people who thought an earthquake was occurring. Once, when Organ Professor David Dahl showed the organ to Rudolph von Beckerath, a German classical organ builder, a basketball shot out of the low C Diaphone pipe after a few seconds of no sound. Having never heard a Diaphone before, von Beckerath asked, "Does it do this every time?" The organ remained at Pacific Lutheran University until 1973, when Spokane First Church of the Nazarene was looking for a suitable pipe organ for its new building, then under construction. 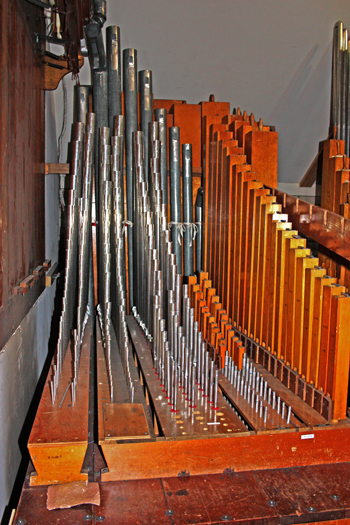 PLU wanted to part with the organ in favor of a classical instrument more suited to teaching and literature, so they sold it to the church for $5,000. Due to budget and other reasons, the installation - started by Clele d'Autrey of Portland, OR and continued by Harold B. Curryer of Spokane, WA - was not fully finished. Several ranks were left unwinded, and other ranks were added to replace those which had gone elsewhere, including a Viola, Voix Celeste, Dulciana and Trumpet that took the place of the Echo division, which had parted ways with the main organ in 1955. In the 1990s, Russ Evans and Greg Smith of Seattle did their best to remedy the problems caused by the original church installation, rewinding and wiring many ranks, but a full renovation was needed. This was finally approved in 2006 under the supervision of Clint Meadway and Evans. Click here for the complete spec; click here for the stoplist. Click here for more pictures of the Wurlitzer on Facebook. 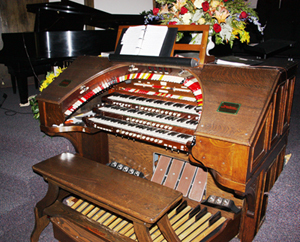 Original console of Spokane First Nazarene Church's 3/24 Wurlitzer/composite theatre pipe organ. Original console, with nonoriginal backrail. This was one of the largest single-bolster consoles built by Wurlitzer. It was replaced in 2013 with a double-bolster console, properly specified for additions acquired over the years to expand the organ to 3/31.